The Maryland National Guard takes great pleasure in recognizing its citizen soldiers and airmen who stand out in their military and civilian careers. 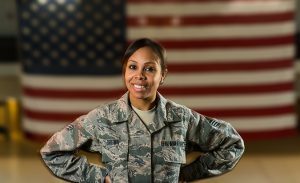 This quarter, the MDNG would like to highlight Senior Airman Robin L. Brown for her professionalism as a base service specialist with the Maryland Air National Guard. She also has a love for roller derby and is a member of a group that brings joy to hospitalized children through cosplay. 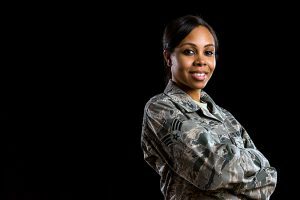 Q: Why did you join the Maryland Air National Guard? A: Well, my dad was prior service. He was in the Marines and the Air Force. Also, at that time, I wasn’t really doing anything with my life. It was pretty much just my son and I. I was a stay-at-home mom and I thought joining would be a great opportunity me. I’ve always liked the Air Force. I wanted to stay local and close to my family. So, a friend told me about the Air National Guard. I’ve lived here [Baltimore] my whole life and never knew we had an Air Guard base. It seemed to fit perfectly into what I was looking for. Q: What is your job in the Air Guard? A: I work full time as a base service specialist at Warfield Air National Guard Base. I cook, provide lodging, conduct physical fitness, and provide mortuary support. We are pretty flexible in services. I love my job. I’ve learned so much in such a short time here. I also enjoy the fact that it’s not always the same thing day to day. Q: What do you do during drill weekend? A: I’m part of the fitness staff. I coordinate all physical fitness tests, I manage the fitness improvement program, I can bring in a nutritionist to provide information to the all of the Airmen. Q: What do you do when you’re not serving? Do you have any hobbies? A: Yes, I enjoy participating in cosplay. It gives me a chance to bring my favorite characters to life, with my added inspiration. Cosplays is a fun family activity. We all work on costumes and then we go show them off at conventions. My son likes cosplay as well. I never go to an event without him. It’s definitely a way I can bond with him. cosplay is not just a group of people coming together and dressing up as a character, we have an agenda and a purpose to why we dress up. Q: What did you do before you joined the Maryland Air National Guard? A: Before I joined the military I did roller derby. I don’t do it anymore, but I still love it. I loved the independence in it. We did everything ourselves. We built our own floors. We secured our own practice place. We raised our own money. I’ve always loved it, and it was fun. You get to meet a lot of different people. I’ve played against people from all over the world. I got to travel with the team. I got to play on the biggest derby stage ever. I went to nationals and we were ranked 13th in the world. I was a jammer, so my job was to score as many points as possible. Q: Do you feel you’ve learned a few skills from playing roller derby that you’ve applied in the Air Force? Q: Do you consider yourself a serious person when it comes to performing your job duties in the Maryland Air National Guard? A: Definitely. I do a lot of fitness and everybody knows that fitness is a big deal in the Air Guard, especially if your career is based on it. It could make it or break it. So, I have to remember that I’m in this job for a reason and I have to do it to the best of my abilities.